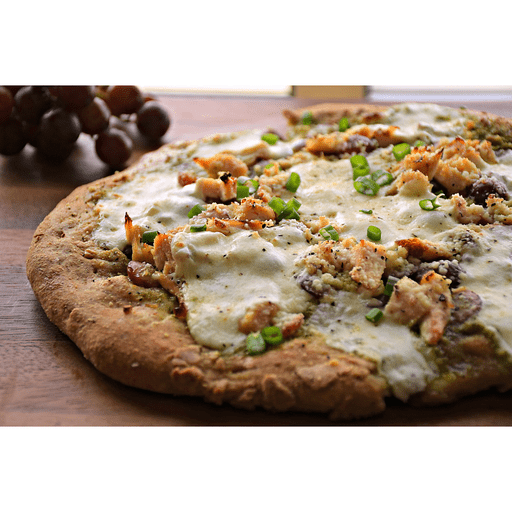 Loaded with juicy, roasted red grapes, protein-packed chicken and pesto filled with yummy, Italian flavors, this scrumptious, gourmet-inspired pizza is way better than delivery. And, with the help of pre-made ingredients this delicious and nutritious pizza is ready in just 20 short minutes. 1. Preheat oven to 425°F. 1. Gently place dough on a pizza pan coated with cooking spray. Spread pesto evenly over dough, leaving a ½-inch border around the edges. Arrange grapes in a single layer over dough 1. top with chicken. Top with garlic and mozzarella. Sprinkle with Romano and pepper. 1. Bake for 15 minutes or until crust is golden brown. Sprinkle with green onions. Cut and serve. For gluten free: Use pre-baked gluten free pizza crust. Calories 350, Total Fat 15g (Saturated 6g, Trans 0g), Cholesterol 55mg, Sodium 490mg, Total Carbohydrate 31g (Dietary Fiber 5g, Sugars 9g), Protein 23g, Vitamin A 10%, Vitamin C 6%, Calcium 25%, Iron 10% *Nutritional values are an approximation. Actual nutritional values may vary due to preparation techniques, variations related to suppliers, regional and seasonal differences, or rounding.